Who Makes Ariens AX Engines? LCT is one of the best snow blower engines on the market. When Tecumseh quit making engines, they took that technology and gave it the refinements that were sorely needed for snow engines. Today’s LCT engines are arguably the best snow engine for dependability, starting, and power for cc’s. They are fuel efficient and quiet. Of course use good, fresh fuel and always use a fuel stabilizer. 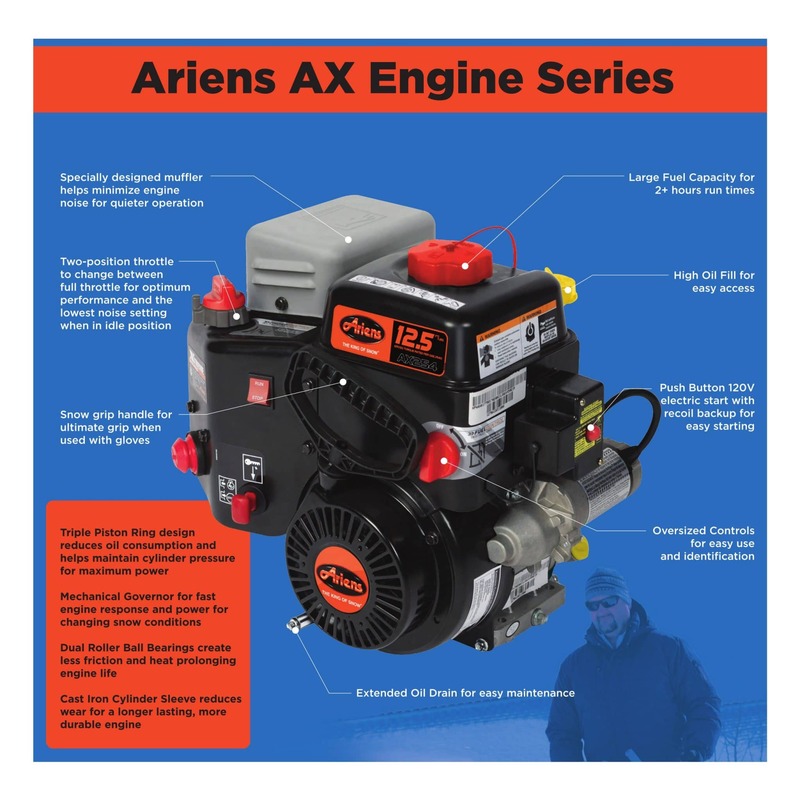 Ariens AX engines are serviced warrantied through the Ariens dealer network. You do not have to contact the manufacturer or another servicing network for warranty repairs. Click on the picture below to see the features of this motor! I do want to say that LCT like the other engine brands makes different quality engines for different applications. The Ariens AX and Husqvarna Snow King engines are best LCT has to offer. The other LCT motors you may find on other snow blowers do not have the same specs. Hi Gil, the straight answer is LCT is an American company. They own their own manufacturing plant in China. The AX engines are made there. Hi, Paul….A Google search for info about the Ariens AX engines brought me to your site. I have to commend you for a very informative site. I spent many hours researching my next snowblower purchase, but I wish I had found you earlier in my search. I finally made my decision to purchase an Ariens snowblower 24-inch “Classic” (Model # 920025). While getting acquainted with the machine, I noticed that there appears to be 2 models of the AX (LCT) for the same model blower. The most obvious difference is the oil filler location. One has the tall upright tube with the long dipstick and the other has the old style short one which screws into the bottom of the block. My engine was built in March of this year (2018). I’m wondering if this is a recent change and are there any other differences that you know of in these 2 engines..?? Thanks, Paul, and I’ll be sure to click the links you provided for future purchases. Hi Richie, Without talking to Ariens I can think of two reasons for the difference. 1. Ariens does a very good job of keeping up with technology. Carb changes, emissions changes, cooling/fuel efficiency improvements, etc. So, they change the engines as needed. I do know the current engine starts a lot better than the same size engine they used on the SnoTek snow blowers. 2. The other reason that happens is the buyer who ordered the engines forgot to add the oil filler tube. I’m sure you’ve been asked this before: What does the 254CC equal in HP? I need to know what the HP is before I buy anything. Why do they do that nowadays?? Hi Patrick, Why do they do that? 1. Because all brands now sell globally and the U.S. is the only country left that is stuck on HP. Everyone else uses a different measure of available power. 2. A lawsuit. HP as rated only measures the engine HP and is not an accurate representation of the available power of the machine to do the job. For example, Farm tractors are rated in engine HP, PTO HP and ground HP. The older tractors were also listed with belt HP. 3. There are different standards that can be used so the HP ratings really are messed up. For example, Kawasaki uses a different government standard to measure HP than Briggs. I live in Saint Joseph, MI and my driveway is 35′ x 70′. It has about a 10% grade. Which would you choose, an Ariens Deluxe 24 or a Toro Power Max 826 OXE? The Ariens is about $100 more. Hi Mike, in all honesty I would pick either one. If I had to chose for your driveway though I’d pick the Ariens because it has the taller tires. They will give you a little better traction.